Wincanton Community Hospital is holding a recruitment event on the 15th May 2018 for trained nurses. This is a fantastic opportunity for newly qualified or experienced nurses to come and see what we can offer. The Friends of Wincanton Community Hospital are holding their 2017 Christmas Fayre on Sunday 26th November. There'll be gifts, crafts, face painting, cakes, a bouncy castle, miniature steam train rides, a BBQ and lots more. With the kind help of hospital staff, Friends and volunteers, Wincanton’s Community Hospital Annual Fete was a huge success, raising much-needed funds for the hospital and ensuring a fun afternoon for all who attended. The Wincanton Community Hospital Christmas Fayre takes place at the Hospital on Sunday 30th November between 2.00pm and 4.00pm. 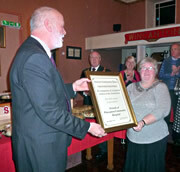 The Friends of Wincanton Community Hospital have reason to be proud, having won a prestigious award for service in the community in December 2013, the first such award to be presented by the Mayor. 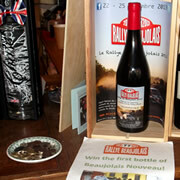 After its unique journey from France in a classic Mini Cooper, a rather special bottle of Beaujolais finally made its way to a happy owner on 14th December, when it was drawn in a charity raffle at Divine Wines in Wincanton. The first bottle of 2013 Beaujolais Nouveau has arrived in Wincanton from France in the boot of Stephen's classic 1966 Mini Cooper "Nicole". The wine will now be raffled by Divine Wines to raise money for Wincanton Community Hospital. Gazette journalist Stephen Davy-Osborne with co-driver Bryan Scant will soon set off on a daring 1,700 mile round trip to France to collect a bottle of this year's harvest of Beaujolais Nouveau to be raffled for Wincanton Hospital. 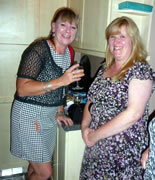 Even the rain did not dampen the evening of the Friends of Wincanton Community Hospital Garden Party. And what a wonderful evening it turned out to be. A Garden Party is being held by the Friends of Wincanton Community Hospital on Friday 13th September at the Otter Garden Centre as part of their continual fundraising programme. 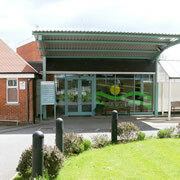 The work of the Friends of Wincanton Community Hospital has brought many improvements to hospital buildings, medical equipment and the comfort of patients. 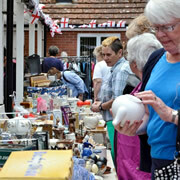 Join them on Saturday 13th July for their Summer fete and help to raise more money for the good of the hospital. 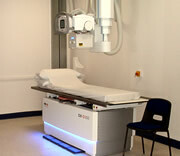 The Wincanton Community Hospital is hosting an Open Day from 11am to 4pm on Sunday 30th June, marking the official opening of the new Radiology Suite. 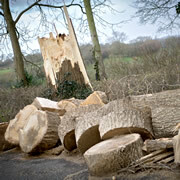 Enjoy lunch with a hog roast and take a tour of the new suite. For several weeks, raffle tickets in support of the Scanner Appeal for Wincanton Community Hospital have been available at a local garden centre. 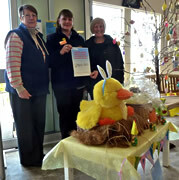 Read on to find out the winning name of the giant fluffy duck and the amount raised. Race Night for Wincanton Community Hospital - Tally Ho, They're Off! 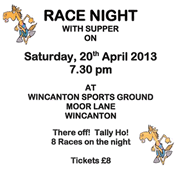 Friends of Wincanton Community Hospital have teamed up with Wincanton Town Football Club to bring a night of fun and racing at the Sports Ground Moor Lane Wincanton on Saturday 20th April. 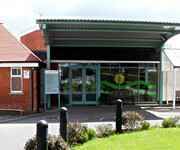 The quality of patient meals at two South Somerset community hospitals has been given the highest rating by inspectors. This year an assessment of standards at Wincanton and Crewkerne Community Hospitals resulted in an 'excellent' rating for the quality of their patient meals. The Bishop of Bath and Wells visited Wincanton Community Hospital recently and showed his support for the 'Friends' Christmas Scanner Appeal. 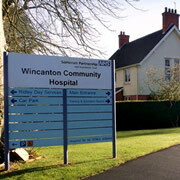 Plans to expand Wincanton Community Hospital could be brought to a halt if consent to build 58 homes near Verrington Lane goes ahead. 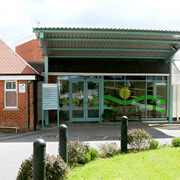 If approved, the development could see a longstanding agreement for a road through the hospital car park activated. Nurses and healthcare staff at Wincanton Community Hospital are leading by example when it comes to maintaining good hand hygiene and preventing the spread of infections.